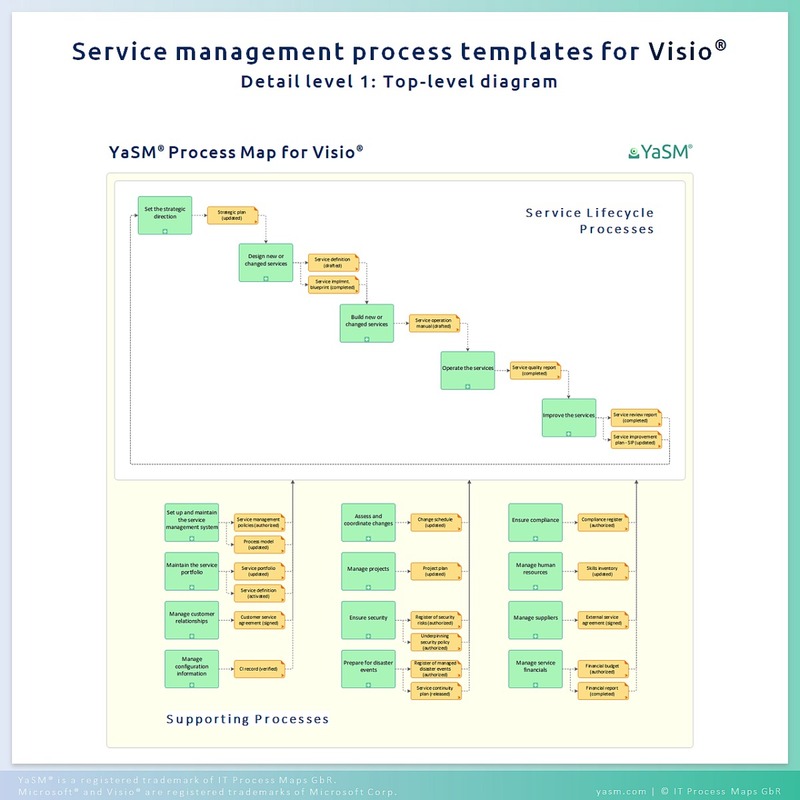 The main entry point into the YaSM Process Map for Visio is the 'top-level diagram'. It presents a high-level view of the YaSM service management processes. The top areas of the flowchart diagrams illustrate the process interfaces in detail. Underneath the top area, the flowchart diagrams contain one or several rows ("swim lanes") with a detailed account of the process activities. The process structure diagram shows the YaSM process structure on a single page. This diagram can be used for directly navigating to specific overview or flowchart diagrams on the main or sub-process levels. The YaSM data object model provides a complete overview of the key relationships between the YaSM data objects (documents and records). Its purpose is to facilitate an understanding of each object's relevance within the YaSM framework. If you would like to see full-size examples of these diagrams, please open the collection of screen shots from the YaSM Process Map in PDF format. The RACI matrix is supplied in the form of an Excel® table. The process names in the column on the left are configured with hyperlinks; this makes it possible to open the Visio diagram for a particular process directly from the matrix. A custom Visio add-in to store and manage descriptive information and link data of the objects used in the process model in a simple Excel repository (check out our special page on the repository add-in). Platform/ environment: Microsoft Visio® 2010 or above (Microsoft Visio® licenses are not included). Adapting the YaSM Process Map: How to adapt the service management processes to the needs of your organization. The YaSM Process Map for Visio and SharePoint: How to use Microsoft SharePoint for sharing the YaSM processes throughout your organization.